"The kids, that's the highest cost," says Ido Lev, 30, who hasn't seen his two children for five years. It's hard to imagine the software engineering student, now wearing jeans and a checked shirt, in the black hat and suit of the ultra-orthodox Jew he used to be. It is seven years since he walked out of his home, cut off his curly side locks in a public toilet and slept in a shopping mall for a week. 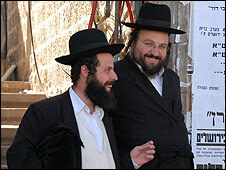 Israel's ultra-orthodox Jews, also known as Haredim, make up roughly 10% of the population. Most live their lives in voluntary isolation from the secular world. Men tend to spend their days studying the Jewish scriptures, which are the primary focus of education for both genders. 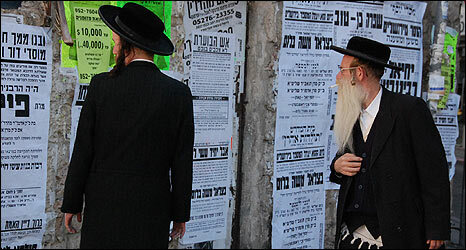 Posters on the walls of ultra-orthodox areas pass on community news, as many residents shield themselves from what they see as the secular influence of television and radio. Images of women are banned, and in some areas, anyone driving on the Jewish Sabbath may have stones thrown at their car. Every detail of life is determined by religious observance, says Mr Lev, "even how you put on your shoes". Those who choose to leave know little about the world they are entering. "They are like aliens," says Irit Paneth of the organisation Hillel, which offers practical help to former Haredim. They often do not know how to open a bank account, use the internet, find work and rent an apartment, she explains, or how to operate socially in the secular world. And they can face angry rejection from the community they leave behind. Mr Lev says his wife's family have stopped him seeing his children, fearing he will persuade them to leave the community. But he says he has no regrets, although he is still battling for access. His marriage had been arranged by his family; now he has a girlfriend. "I found out what love is. That makes it very complicated, but very joyful," he says. In the first few months after he left, he says he "felt like a drunk from all the freedom". Another member of Hillel, Chani Ovadya, 28, says she and her parents did not speak for a year after she left the religious way of life. She had secretly rented a flat and moved her clothes, a few at a time, before she left home. "It was the hardest year of my life, and I didn't have my parents and family who I love with me, so it was even worse," she says. 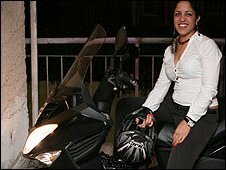 Her demure long skirt gone, she is clad in a tight, low-cut shirt, spiky heels and tailored trousers and now rides a motorbike and studies engineering. "As a religious woman, the most you can be is a teacher," she says. "Now I am following my dreams." Ms Paneth stresses that Hillel does not persuade people to leave, but merely provides practical help and emotional support to those who decide for themselves to do so. "For years, most of them live in between worlds," says Ms Paneth. "They don't really belong to the secular world - they definitely don't belong any more to the ultra-orthodox world," she says. Ms Paneth believes the 2,000 or so people Hillel has helped in the past decade are "the tip of the iceberg", and that numbers are growing as the internet makes the secular world more accessible. 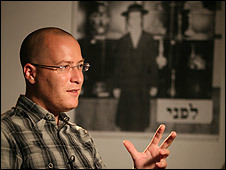 Anthropologist Sarit Barzilai has studied former Haredim. She explains that closed ultra-orthodox areas were formed after Israel was created because their immigrant residents wanted to preserve their traditional way of life. The fear of secular society is so strong that if a son or daughter chooses to leave, for parents it can be "the end of the world", she says. If one child leaves, it can harm the marriage prospects of their brothers and sisters, or influence siblings to make the break too, she explains. In one case she knows of, a father told his daughter he would rather kill her than see her become secular. She eventually committed suicide. "It breaks people's hearts," says Rabbi Noson Weisz, who teaches at Aish HaTorah, an ultra-orthodox yeshiva, or seminary, close to the Western Wall, one of Judaism's holiest sites. He articulates what he describes as an "impossible dilemma" for parents if a child wants to leave. I think if I can only hang on to this child he'll get over whatever his problem is, but while he's going through this, if I have him in the house, what kind of influence will this have on my other children?" But he says he would never advise parents to completely cut off contact. He says ultra-orthodox society is broader than its stereotype and includes many people who work in professions in the secular world. If people leave, this means the community has failed them. 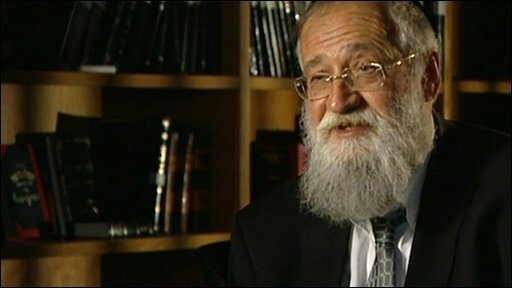 He says he has only known four or five cases of people leaving in three decades of work, while he has seen thousands of Jews move from secular to religious lifestyles. In the school's prayer hall, young men rock back and forth over leather-bound books, while others debate points of scripture. For them, there is an enriching life, focused on family, community and meaning, to be found here. "There are 613 laws that we live by, but I would look at it as 613 possibilities and ways of connecting to God," says British student Michael Mann. And Mr Lev agrees there is value in ultra-orthodox life for some people. "Maybe to people outside it looks like a cult, maybe a little primitive," he says, but he believes it can be "a happy community" and a "very beautiful place". "But if you don't have the faith inside, it's like a jail."